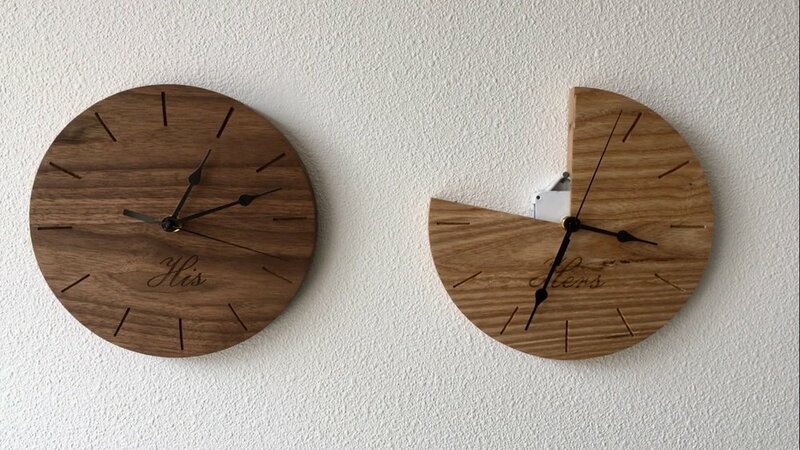 New Work: "Lies I've Been Told: 'My time is more valuable than your time' (His & Hers Clocks)"
This was the first artwork I've made since leaving school that has made me feel that I can make something meaningful, something that can help me express my fears and frustration while reclaiming a damaging moment and making myself strong again. Many women can identify with this work, society expects us to play so many roles and wear so many hats. In my personal narrative, I worked full time, was a housekeeper, cooked, cleaned and did everything I could to help our lives move forward. My partner (fiance) at the time, worked hard but not necessarily harder than I did. The fact that he made 3-4 times as much money as I did gave him the right to make our major life decisions without me, because of his income he could control our purchases, our living situations and used it to berate me in our joint spending. He told me my time wasn't as valuable as his and that gave him the right to make choices for me. On a side note, I am not a fan of his & hers monogrammed objects. Once I updated my Facebook status to "engaged" I received countless targeted advertisements concerning wedding products and dresses while he received none of the like. A year and a half after the end of that relationship, I still receive these ads. Society's idea that women are obsessed with weddings, marriage and commitment is ridiculous and frankly annoying. We are being asked to make less, spend more and accept small decreases in the wadge gap as victories. According to a study by the Joint Economic Committee women earn, on average, 79 cents for every dollar that men make. In the US this wage gap can drop as low as 35" in certain states. Women are also more likely to learn less if they are people of color or have children, whereas white men and men with children are more likely to earn more. The "Hers" clock is at 79%, a 21% difference that we are all painfully aware of. My goal to combine my personal narratives and domestic objects is to adapt their functionality. Clocks are timepieces that are made to bring order and to help us create a more systematic world, I would argue this is an object of comfort, the ability for us to track time gives order to our lifestyles. I think my attempt here is to reclaim these words and to address the notion that we set systems in place to protect us, though prejudice and inequality still prevail. Only when we can become comfortable with discussing these topics (not complacent) can we actually make change.